The sound of groans may have filled the Wembley air as France humbled England this week, but there are more positive noises emanating from the FA's headquarters about the health of the grassroots game. The Football Association released results for Season Two of the National Game Strategy (NGS) last week and the headline message from the governing body is that the grassroots game across England is "thriving". When the NGS was released in 2008, development targets were set out across six areas: growing participation, standards of behaviour, devloping better players, running the game effectively, supporting the workforce and improving facilities. 14 of the 19 targets set are on course to be met at this halfway stage, whilst in some areas progress is exceeding expectations by some margin. Among these is the area of youth development, where the 1.83 million children to have passed through The FA Tesco Skills programme surpasses not only the FA's 2010 target (1.43m) but the final 2012 target of 1.67m. The FA hope that their Tesco Skills programme, along with the 1,745 new youth teams created across the country, will help improve the skills of today’s younger generation to be more technically-adept adult players in the future. At adult level, the decline in male 11 v 11 football - a key focus for The FA last year - has been reversed, something that pleases the FA's Head of National Game, Kelly Simmons. “We are delighted by the continued progress we are making, said Simmons. "I am particularly pleased that we have managed to stop the decline in men’s 11-a-side - the game at the heart of grassroots football." Whilst the 30,701 mens teams now registered with leagues across England is over 400 teams short of the FA's 2010 target, the decline in numbers witnessed as recently as last year has now been reversed, with the FA aiming to increase the number to 30,995 in the 12 months. 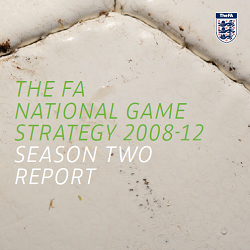 Click here to view the National Game Stategy Year Two Report (pdf file). What do you think of the NGS Year Two Report? Do you agree with the FA that the grassroots game in England is thriving? 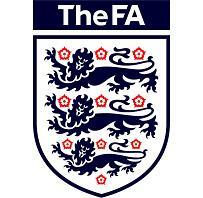 How do you think the FA is doing in developing and nurturing the national game? And it doesn't matter if you're English, Welsh, Scottish or Irish - we want to hear what you think about the state of the grassroots football in this country and whether the game's governing bodies are focussing their efforts in the right areas. Give us your thoughts and questions and we'll be putting the best of them to key figures from each of the Football Associations throughout this season.